Almost three-quarters of investment professionals worldwide (73 percent) take environmental, social, and corporate governance — ESG issues into consideration in the investment process, according to the CFA Institute ESG Survey, a new survey of CFA Institute members created by CFA Institute and the Investor Responsibility Research Center Institute (IRRC Institute). In addition, 64 percent of survey respondents consider corporate governance issues, 50 percent consider environmental issues, and 49 percent consider social issues in investment decisions. Only 27 percent do not consider ESG issues. CFA Institute believes that every investment analyst should be able to identify and properly evaluate investment risks, and ESG issues are a part of this. Our exam curriculum emphasizes risk management, and our members are increasingly interested in continuing education materials on ESG. This survey demonstrates how serious investment professionals are considering these issues and how practice and methodology are evolving. Overall, the survey creates a robust data baseline for investors, companies and ESG data providers. But, most importantly, this survey digs deeper than the simple question of, ‘Is ESG important?’ The nuances are important and provide much needed insight on how investors and analysts actually use ESG data and what data is most relevant. For example, the survey findings not only tell us that investors generally want external assurance about ESG data, but also about the preferred level of assurance, and about how much investors are willing to pay for ESG assurances. Risk evaluation: Sixty-three percent of survey respondents said they consider ESG issues in the investment decision making process to help manage investment risks, 44 percent say that their clients/investors demand it and 38 percent said ESG performance is a proxy for management quality. Top three issues in decision-making: Survey respondents ranked board accountability, human capital, and executive compensation as the issues most important to investment analysis and decision-making. Regional breakdown: A high proportion of CFA Institute members in the Asia-Pacific region considered ESG issues (78 percent), followed closely by members in the Europe, Middle East, and Africa (EMEA) region (74 percent). Most discouraging to me, respondents in the Americas region were the least likely to use ESG information in their decision-making process, but, even here, a solid majority (59 percent) do use ESG factors. ESG integration in the investment process: Fifty-seven percent of respondents integrate ESG into the whole investment analysis and decision-making process, while 38 percent use best-in-class positive alignment; 36 percent use ESG analysis for exclusionary screening. ESG disclosures: Sixty-one percent of survey respondents agreed that public companies should be required to report at least annually on a cohesive set of sustainability indicators in accordance with the most up-to-date reporting framework. In addition, 69 percent of these respondents say ESG disclosures should be subject to independent verification. Furthermore, of these, 44 percent believe that verification at a high level of assurance, similar to an audit, is necessary. Another 46 percent believe limited verification, or a lower level of assurance, is necessary. When this group was asked how much should be spent on independent verification, responses varied from 10 percent to 100 percent of the cost of an audit of financial statements. According to a recent report on trends from the Global Reporting Initiative (GRI) found that 93% of the world’s largest 250 companies were reporting in 2013. Download the CFA Institute ESG Survey here. 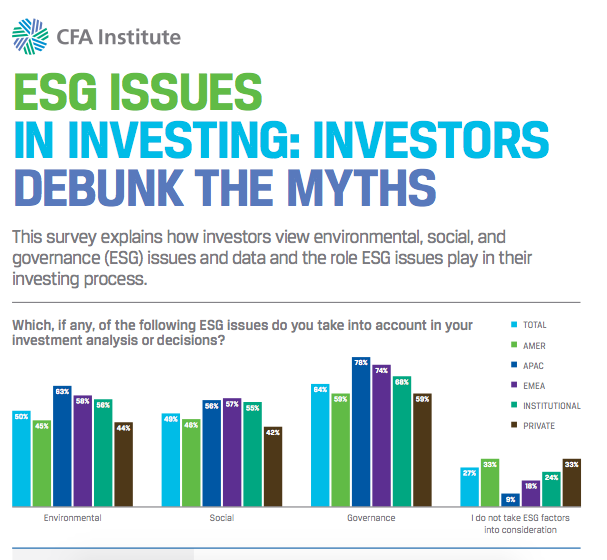 Download ESG Issues in Investing: Investors Debunk the Myths ESG Issues here. An online survey was conducted from 26 May to 5 June 2015. 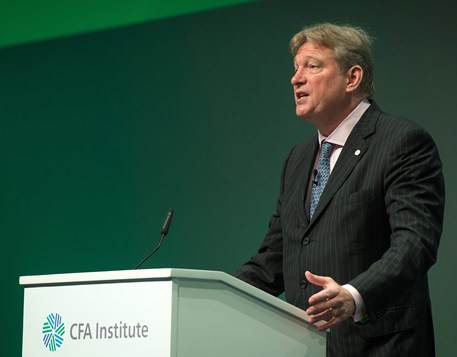 Some 1,325 members of CFA Institute who are portfolio managers or research analysts responded to the survey for a response rate of 3 percent. The margin of error for the survey was +/- 2.7 percent. Regional Breakdown: 68 percent from Americas, 21 percent EMEA, 11 percent APAC. Primary Asset Base: 41% primarily deal with institutional clients, 31 percent private clients, 16 percent both, and 12 percent not applicable. 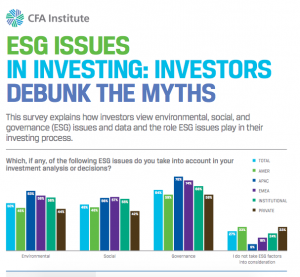 Survey results will help inform a new CFA Institute ESG guide for investors, due to be published in late 2015. A webinar is scheduled for Wednesday, August 26, 2015, at 10:00 AM ET to review the findings. Register here. The Investor Responsibility Research Center Institute is a nonprofit research organization that funds academic and practitioner research that enables investors, policymakers and other stakeholders to make data-driven decisions. IRRCi research covers a wide range of topics of interest to investors, is objective, unbiased, and disseminated widely. CFA Institute is the global association of investment professionals that sets the standard for professional excellence and credentials. The organization is a champion for ethical behavior in investment markets and a respected source of knowledge in the global financial community. The end goal: to create an environment where investors’ interests come first, markets function at their best, and economies grow. CFA Institute has more than 132,000 members in 151 countries and territories, including 124,700 charterholders, and 145 member societies. CFA Institute offers members and investors many resources on ESG issues to better educate themselves. ESG reading materials are also included in the CFA Institute curriculum to ensure that the next generation of financial professionals understands current global investment practice. CFA believes that every financial analyst conducting investment analysis should have knowledge of the risks and opportunities of environmental, social, and governance (ESG) issues in investing.